It’s widely recognised that for those without a family, Christmas can be a very lonely time of year. But after the decorations have been put away and the annual visit from the relatives is over, January and February can be a real struggle for many, particularly older people. For lots of us going back to work after the holidays provokes much grumbling and resentment, but it is easy to forget that work provides important social interaction. What if you had no reason to get up and go out? Human beings are social creatures, we thrive in communities and interaction is vital for our mental wellbeing. Loneliness amongst older people is a problem all year round, Age UK research found that over one million people aged 65 or over in the UK (10%) say they always or often feel lonely. But in the winter months the cold weather can mean people are less able to get out and about, and for those who live alone, which the according to the ONS is over half (51%) of all people aged over 75, this can mean going days or even weeks barely speaking to another person. This loneliness can have not just crushing psychological effects, but profound effects on mortality and physical health. Studies show that the mental and physical effects can be equivalent to smoking 15 cigarettes a day. It is at this time of year, with money often at its tightest, when buses and the concessionary bus pass for older people can be a real life line for those who would otherwise not have the means get out and about. 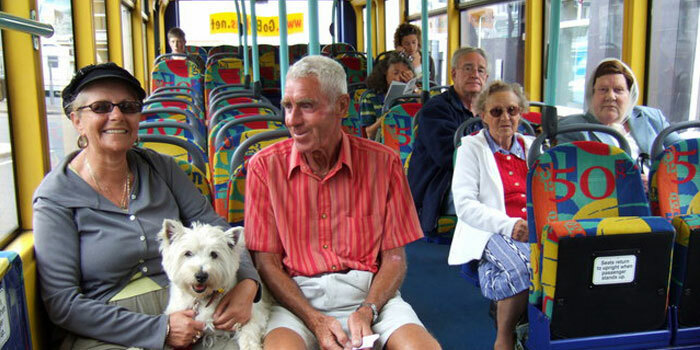 The bus pass provides older people with the means to be active, visit friends, volunteer and access shops and services, all of which are recommended by the NHS as ways to combat loneliness. Keeping older people connected is not only vital for their wellbeing, it also benefits us and society as a whole. Last year Greener Journeys worked with KPMG to explore the benefits that concessionary bus travel brings to the UK’s society and economy. In-depth analysis by KPMG showed every £1 spent on the bus pass generated over £2.87 of benefits. This does not include the positive impact the scheme has on social inclusion, mental health and wellbeing as it is extremely difficult to quantify in financial terms in a reliable way. However what was clear from anecdotal evidence, and the evidence of our case studies, is that the bus pass is hugely valuable to their interaction with friends, family and wider society. The value of tackling loneliness, giving older people the ability to stay active is beyond financial measure. Growing old shouldn’t make you a captive in your own home and being senior shouldn’t mean shutting yourself away for the winter. That is why we are keeping up the pressure and volume around our campaign for the safeguarding of the Older Persons Bus Pass. It is absolutely crucial that all political parties recognise the scheme’s importance and commit to it for the long-term. Not only is it good for our elders, as our report shows, it’s good for the whole of our society too. Very poignant article Claire. Even in London (where people are perceived to be unfriendly and keep in their own little bubbles on public transport), there is a spirit of collaboration, especially when there is a breakdown or some transport set back. No matter how much space we need as individuals, as a society, we can and do like and need to interact on an informal basis – and the bus is a great forum in the outdoors but a contained space. People moan together and giggle and all barriers are broken down on nightbuses!